Synchronizing Todo using iCloud : Appigo Inc.
Make sure all of your tasks are in Todo. Create an iTunes backup of your device. Go into your device settings > iCloud and make sure Documents & Data is turned on. Now open Todo > Settings > Synchronization > Switch Services > Switch. Select Online Sync > iCloud > Use iCloud > MERGE (if you do not merge your data in Todo will be erased). Your tasks will automatically sync through iCloud from on. Select one of your devices that contains all of your Todo data. This will be your master device. On the master device open the device settings > iCloud and make sure Documents & Data is turned on. If you have more devices you wish to sync with, follow the steps for "Others Device" on any remaining devices. Why are my iCal reminders not syncing with Todo? 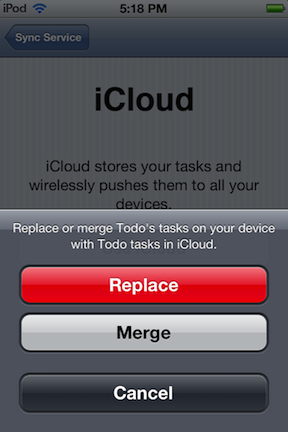 Todo uses iCloud to sync tasks between different instances of Todo running on your devices. Todo's task data in iCloud is currently separate from the iCal task data stored in iCloud. To illustrate this, think of iCloud as a large filing cabinet. iCal and Todo are each given separate folders in the filing cabinet; documents stored in the iCal folder are separate from documents stored in the Todo folder. When you make changes to one folder, it will not affect the other. We will continue to investigate additional synchronization options. When syncing with iCloud, why can I not press the sync button to sync my tasks? iCloud functions differently than the other sync services that are available. You will notice that as you make changes in Todo the sync icon will change and display an up arrow. This arrow indicates that changes have been made that need to be pushed to iCloud. iCloud will then connect with your device and sync the changes that you have made. These changes are then pushed to your other devices that are syncing with the same iCloud account. There is no longer a need to press the sync button, iCloud just works! Why does iCloud synchronization not work for me? Todo needs the 'Documents & Data' setting to be enabled in order to work. This setting allows third-party apps like Todo to store data in your iCloud account. You can find iCloud settings in your device's settings as shown on Apple's iOS site. If this setting is already enabled, try disabling and then re-enabling it. Try resetting your device, especially if you changed the above setting. Turn off your device by holding the lock button until the red slider appears, then turn it back on. Restarting a device can cause iCloud to notice changes and synchronize your data. If you've purchased Apple's iWork apps (Pages, Keynote, Numbers) you may be able to use them to get iCloud working. First, disable iCloud in your device's settings. Next, open one of the named iWork apps. If you have iOS 5.0 or newer and the latest version of the app you should be asked if you would like to use iCloud. Answer in the affirmative, enter your iCloud account details and make sure that iCloud is working in the app. Finally, see if iCloud now works in Todo and other third-party apps.